Hertha Berlin v Östersunds FK ended in a 1-1 draw, which means that the Swedish side will finish Group J in second place behind Bilbao. 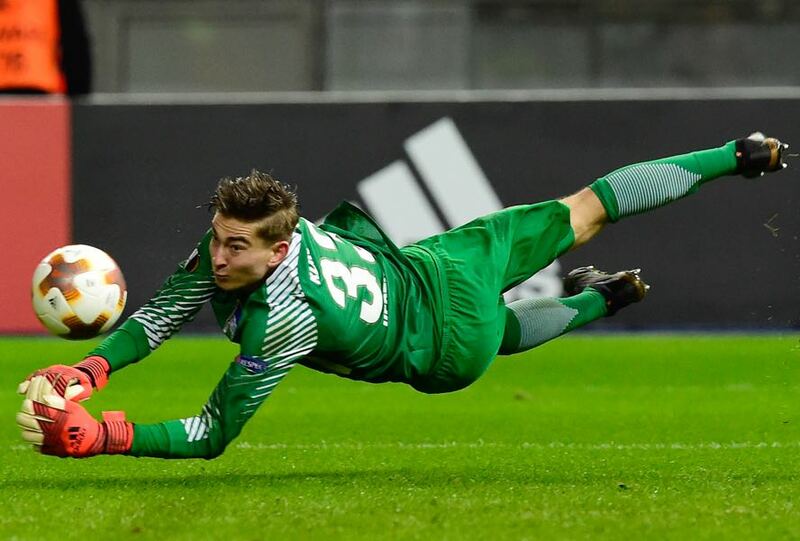 Jonathan Klinsmann makes his debut for Hertha Berlin. Klinsmann stopped a penalty in his first game for Hertha. Östersund fail to finish first. In a game that mattered very little for Hertha and a great deal for the Swedish visitors Berlin head coach Pal Dardai opted to field a very young and inexperienced side—among the starters was Jürgen Klinsmann’s 20-year-old son Jonathan. Östersunds FK in the meantime still had plenty to play for as the Swedish side needed to win to ensure first place in the group. 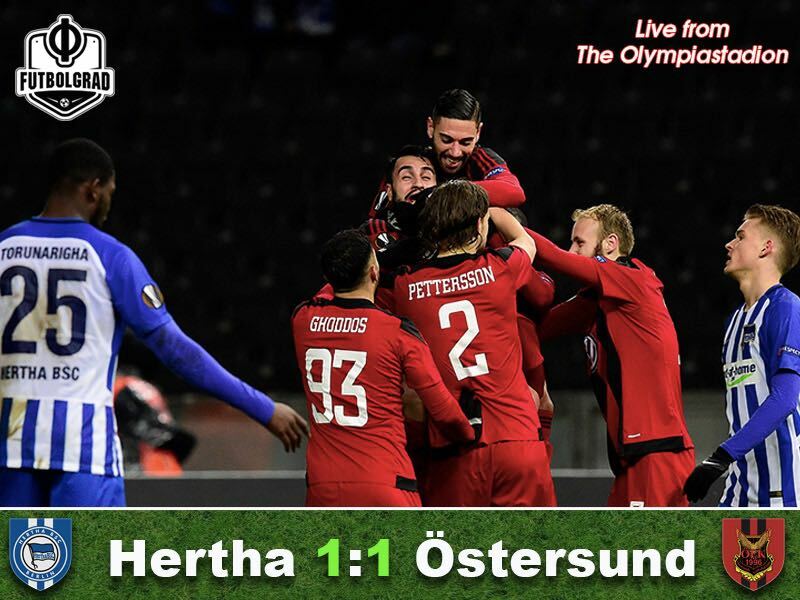 Not surprisingly it was Östersund with the more nervous start giving Hertha the room to develop their attacking play and the club from the capital should have taken the lead in the 18′ when a Palko Dardai shot from 21-yards hit the crossbar. Pal Dardai’s son Palko also had the next chance for Hertha in the 28′. Breaking through on the right edge of the box the winger went one-on-one with goalkeeper Aly Keita, who had to come up with a big stop to keep the Germans off the scoreboard. It took Östersund 30 minutes to register a scoring chance finally. Defender Sotirios Papagiannopoulos joint an attack and let a shot fly from the edge of the box, Klinsmann, however, came up with a big stop. The game became more attractive in the final ten minutes of the second half, and Genki Haraguchi could have done better in the 35′ when he broke away from his man and made a fantastic run into the box, but instead of crossing the ball over to the completely blank Alexander Esswein he tried to finish the play himself and was stopped by Keita. It was the last chance in a relative unattractive half in which Hertha held a slight edge. Hertha was also the more active team in the early goings of the second half and Alexander Esswein 47 and 50 twice tested keeper Keita with long distance shots. Saman Ghoddos then responded in the 57′ minute with the first real chance for the Swedes in the second half. Klinsmann, however, responded well deflecting the shot for a corner kick. The ensuing corner let Östersund’s opening goal. However, Östersunds FK score after Papagiannopoulos was left blank by Hertha’s defence and the centreback made no mistake scoring from close range. The lead would only last for a few moments. However, Maximilian Mittelstädt broke through on the left side of the pitch, and his low cross ended up finding Peter Pekarik, who made no mistake scoring the equaliser. The last 15 minutes of the game began with a double chance for Hertha. Haraguchi managed to bring the ball to the centre where Esswein was ready to score, but Östersund defender Tom Pettersson anticipated the run and was able to block the shot, the ensuing rebound landed at the feet of Valentino Lazaro whose shot was deflected for a corner kick. The game seemed to slowly dwindle to a 1-1 draw until Ken Sema was brought down inside the box by Maximilian Mittelstädt. Brwa Nouri stepped up and was stopped by Klinsmann. Sotirios Papagiannopoulos is not only a nightmare for every sports commentator on the planet to pronounce. He is also a great defender with the ability to be dangerous in the attacking end. The Greek defender scored the opening goal of the match and then kept a tight job at the back guiding his side to one point against Hertha. With Hertha having no chance to qualify from the group head coach Pal Dardai opted to start his son Palko Dardai as well as the son of former German national team captain and world champion Jürgen Klinsmann. Both had a good game, and goalkeeper Jonathan Klinsmann even stopped a penalty to secure one point for Hertha.